Help is what you always hesitate to ask for. Me too. I cannot ask for help from someone even though I am sure that if I ask he will help for sure. It is the human nature which has evolved over the time. Looking back, I find that it was easy to ask for someones help when I was kid. Now it is difficult. I cannot ask for help. I have to figure things out myself. Helping someone is great. I love to help anyone if it is not going against me. How can you expect me to help you for creating troubles against me? It is possible thing with a fool. I am a fool but not this much. I help to make others fool. That brings out cheer and a beer if it is with friends. Helping others also helps to build your image. When to ask help is a big question. You cannot ask for help when that person is in toilet or bathroom. Take the above photo as an example. 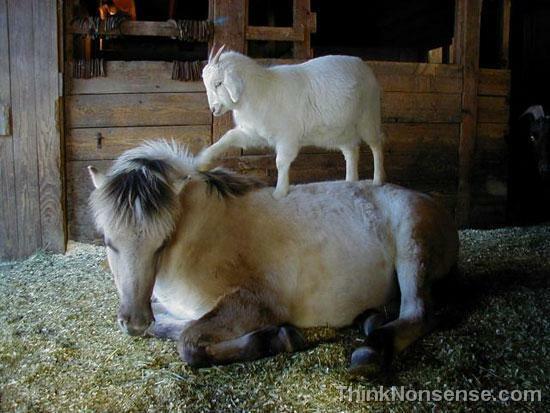 Goat is helping horse to scratch his back. Looks like there is shortage of labors. Would you ask for help? Or do you ask for help anytime?